The burial at Chadron, Nebraska, on May 12th last, of George Currie, as daring a bandit as ever operated in Western America since the days of the famous Jesse and Frank James, was the closing chapter in a career of crime which typifies the now well­ known motto of THE WIDE WORLD MAGAZINE that "Truth is stranger than fiction." 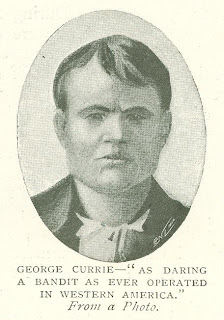 For six or eight years Currie and his band of desperadoes terrorized the law abiding people of Wyoming, Montana, Utah, and Western South Dakota. During that period their opera­tions were not confined to anyone line of depredations. Ten years ago Currie was a cowboy in the employ of a large cattle company whose range was near the eastern border of Wyoming. He was respected by his comrades, and soon gained the reputation of being one of the most experienced cattle " punchers" on the Western plains. Seeing an oppor­tunity to make money more easily and rapidly, he and a few chosen and trusted companions soon began to en­gage in "rustling" or stealing cattle from adjacent owners, the brands of which were changed, and the proceeds of the sale of the animals converted to their own use. Then, the better to carry on their raids against the herds of the cattlemen and cattle companies, and to have a place of refuge when pursued by officers of the law, they established their head­quarters in what is known as the "Hole-in-the-Wall," in Wyoming, where Currie soon surrounded himself with as desperate a band of scoundrels as could be found in the West. Their rendezvous was a natural for­tress, and from its name Currie and his fellow bandits be­came known as the "Hole-in-the-Wall Gang." The Hole-­in-the-Wall is situ­ated in the Big Horn Mountains, about eighty miles northwest of Cas­per, Wyoming, and about fifty miles due south of Buffalo, in the same State. The Hole-in-the-Wall country is a basin between a spur and the main range of the mountains. A huge cliff extends along the eastern side of the mountains in a north and south direction for a dis­tance of about thirty miles. This cliff is per­pendicular and between 400 ft. and 500 ft. in height. Save for one small break in its towering sides the wall is impassable. The break, which is a narrow gorge cut through the solid rock by the action of the waters of Red Fork, Middle Fork, and Buffalo creeks, which join and form Powder River, just inside of the cliff - this break, I say, is the Hole-in-the-Wall. The gorge is almost impassable, being so narrow in places that horses are ridden with great difficulty. Owing to its character a few men could wall up the entrance to this gorge, or the Hole-in-the-Wall, as it is always called, and prevent a small army from entering. Once inside the high cliff a beautiful sight meets the eye of the visitor. A basin twenty miles square spreads out, and is covered in summer with a luxuriant growth of tender grasses, with here and there a clump of scrub ­pine and grease wood. Directly in front of the visitor, after he makes his exit from the narrow defile in the cliffs, is the main range of the Big Horn Mountains, towering above the fertile valley to a height of 12,000 ft. Along the face of this range are numerous narrow and deep canyons, which lead to the rugged depths of the mountains. Numerous caves are here found, which afford excellent hiding places for outlaws and murderers. It is here that the Currie gang found safety for many years. Within the limits of the towering mountains of solid rock the bandits have raised small grain, vegetables, etc., and at different times have run large herds of horses and cattle, which had been stolen from ranches outside the Hole-in-the-Wall, on the range. These herds, after the brands and other marks had been removed or changed in a clever manner, would be driven from the robber retreat to confederates, who were employed on ranches near the Hole-in-the-Wall country, and who would ship the stolen stock to market. In returning, these confederates would pur­chase arms, ammunition, and such other neces­saries as were ordered by the bandits. These methods, however, were adopted only at such times as the bandits were hard pressed by officers of the law. When the latter would give up the hunt for the outlaws, after they had committed one of their numerous crimes, they would come forth from their retreat and rob and plunder until the officers again made the surrounding region too warm to hold them. It was not long before Currie and his comrades found cattle and horse stealing too tame for them, and they then extended their operations to the robbery of post offices and stores at isolated points throughout the four States in which they carried on their depredations. Their bold and desperate crimes have frequently startled the world, and people wondered how such a band of desperadoes could possibly go on for years without paying the penalty for their crimes. The secret of the long years of success achieved by the bandits was due to the fact that, while they were desperate, they were also cautious and shrewd, and had friends throughout the region in which they operated, who would warn them of the approach of officers and frequently assist them in making their escape. During the years 1896 and 1897 these out­laws were especially active, and in spite of the fact that several large posses of officers were in pursuit of them at different times, and engaged in battle with them, they always escaped to their rendezvous in the Big Horn Mountains. During the years mentioned the gang robbed the post office at Powderville, Montana, and shot Postmaster Barnard. They robbed the Butte County Bank, of Belle Fourche, in South Dakota; held up Postmaster Carpenter, of Wolton, Wyo. ; robbed the store of the Wolton Commercial Company, of which Postmaster Carpenter was manager; looted the post office at Granger, Wyo. ; and generally terrorized the citizens of Wyoming, so that they were in constant fear for the safety of their property and even of their lives. 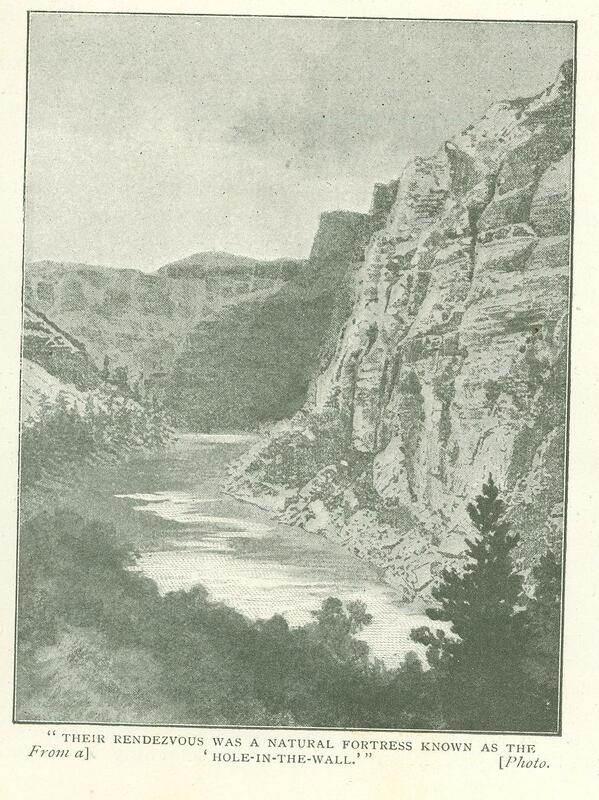 The Belle Fourche bank robbery enriched the gang considerably, and had a tendency to make the bandits careless. As a result three members of the band were captured and con­fined in the Belle Foarche jail, but the place was not strong enough to hold them, and they made their escape and joined their comrades. Soon after the Belle Fourche affair the band robbed the post office at Big Piney, in Western Wyoming. Two days later a posse headed by Sheriff Ward, of Unita County, Wyo., followed the gang up Green River, through the moun­tains to the head of the river, and on to the head waters of the Gros Ventre River. In a narrow defile of the mountains, when the party was temporarily divided, a portion of the sheriff's posse was ambushed. Several members of the posse were badly wounded, and the robbers made their escape for the time being. A few days later the marauders were again located, and driven in a north easterly direction. This time they were followed to a point on the Shoshone Indian reservation, where, however, all trace of them was lost. The United States authorities at Washington, having now become thoroughly aroused, issued instructions to spare neither time nor money in hunt­ing the robbers down. A searching investigation was made, and it was discovered that the bandits had been seen cross­ing Big Wind River, thirty­-five miles above Fort Washa­kie, Wyo. Five days later they crossed the Belle Fourche River near the Missouri Buttes and the Devil's Tower, in the ex­treme eastern portion of the State. The journey to the eastern edge of Wyoming required a trip of 400 miles, and was accomplished in four days. Inquiry showed that one stretch of 150 miles was covered by the bandits in twenty-four hours. Having been so remark­ably successful so far in their operations of different grades, the outlaws next turned their attention to the" holding ­up" and robbing of railroad trains. Their most noted crime of this kind was com­mitted on June 2nd of last year, when they "held-up" the first section of the Union Pacific fast mail, known as the" Overland Flyer," at Wilcox Siding, fifty-eight miles west of Laramie, Wyo. The" hold - up" occurred at 2:15 o'clock on the morning of the date stated. Six masked men, of whom the leader was after­wards ascertained to be George Currie, were con­cerned in the robbery. 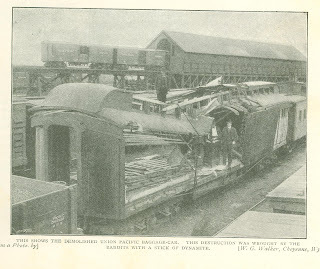 The robbers, first of all, blew up a small bridge just west of a switch at Wilcox Siding, and, flagging the first section, they blew up the express car, which is shown in the accompanying photograph just as it ap­peared after the robbers had left. Engine driver Jones received a bullet through his right hand and a small scalp wound as the result of shots fired by the bandits. No one else was injured. The place selected for this daring train robbery was a favorable one. There is no settlement near. As the railroad company was at the time doing a large amount of grading in the vicinity, it was thought that the bandits had been around in the different grading camps for several days awaiting a favorable opportunity to carry out their plans. The robbers flagged the train with red and white lights and stopped it about a mile and a half west of Wilcox. Four of the six men got on the engine. The conductor came forward to inquire the cause of the train's being stopped, when one of the four men on the engine covered him with a revolver and com­pelled him to remain quiet. The two remaining bandits went for the mail and ex­press car. They cut off the tourist and special cars and took the remainder of the train a mile farther west, where they blew up the express car with dynamite. They then compelled the engine driver to take the mail and express cars to the top of a hill between Aurora and Wilcox, where they blew open and rifled the safe of a sum variously estimated at from £12,000 to £20,000. 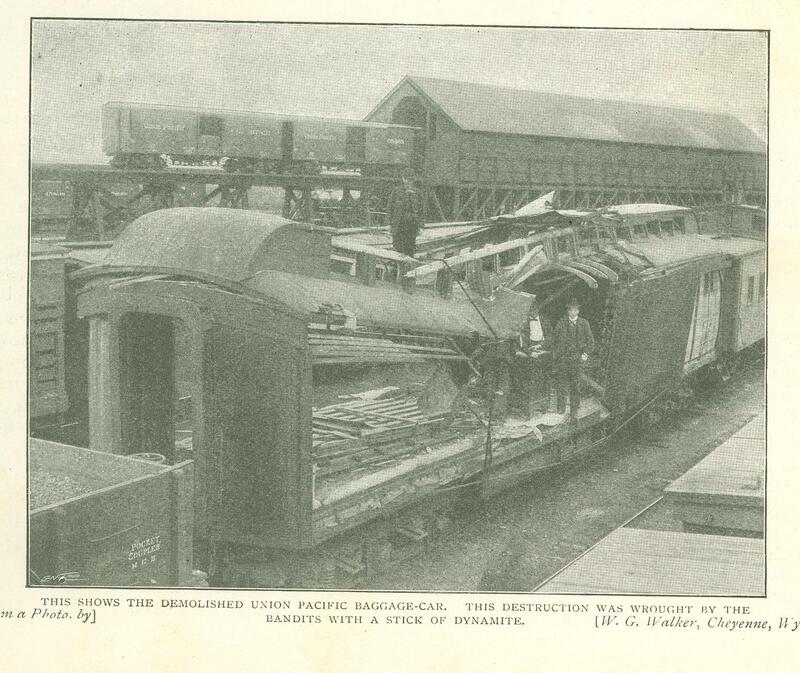 The express matter was badly damaged, but the baggage escaped with only slight injury. 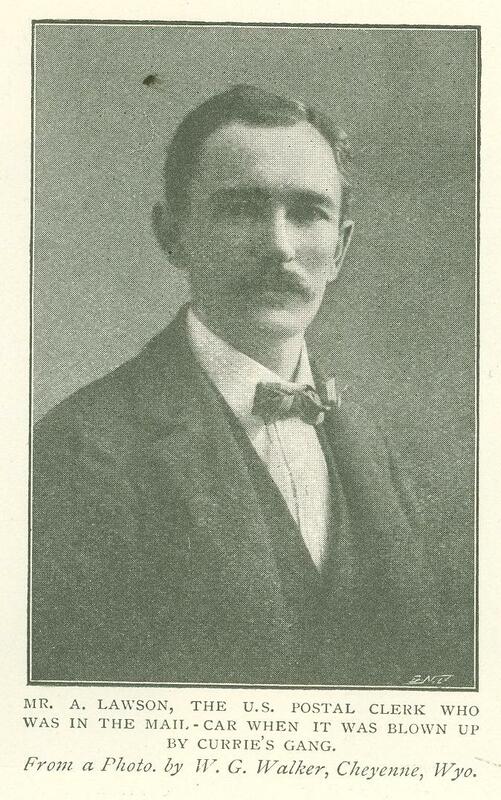 Conductor Storey succeeded in escaping the vigilance of the robbers, and going back along the railroad track prevented a collision by flagging the second section of his train, which was only ten minutes behind him. After completing their work the robbers mounted horses and rode off in a northerly direction. Then commenced a pursuit and chase such as has rarely been equaled in the history of America. The Union Pacific Rail­road' Company and the Pacific Express Company without delay offered joint rewards of £400 for the arrest of each of the six men concerned in the daring " hold-up." The United States Government in­creased this reward, so that a total of £600 was offered for each of the robbers. Governor Richards, of Wyoming, immediately ordered out a company of the State militia, under Cap­tain W. J. Thom, to participate in the efforts to capture the outlaws. 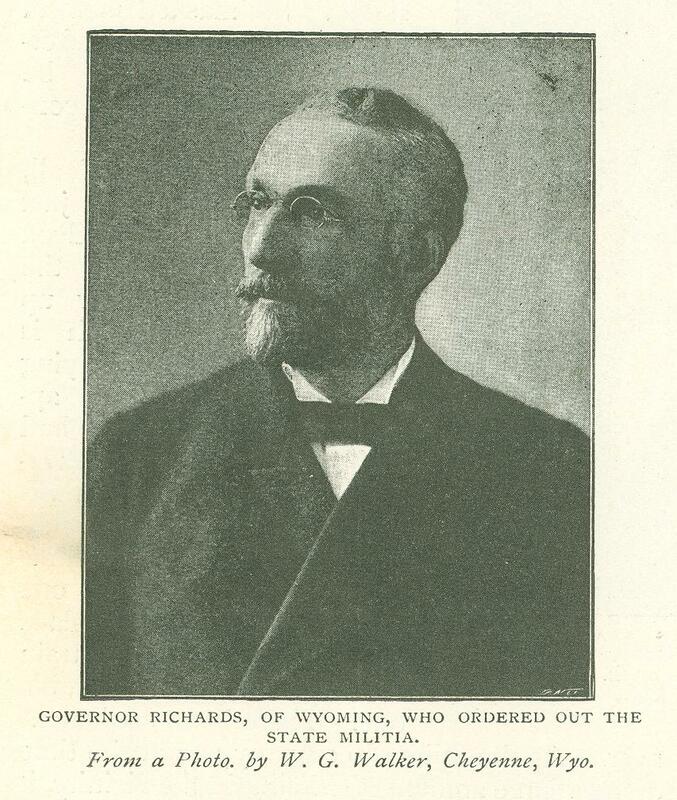 Mr. Frank Hadsell, United States marshal for Wyoming, also proceeded to the scene with all possible speed, and soon himself and a number of his deputies formed part of the posses which took up the trail of the robbers. Others prominent in the pursuing parties were Sheriff Josiah Hazen, of Converse County, Wyoming; John Shaver, sheriff of Laramie County, and Mr. T. J. Carr, a Pinkerton detective. The six men implicated in the" hold-up" were George Currie, George and Tom Roberts, "Lonny" Logan (alias "Lonny" Curry), Harvey Logan (alias Harvey Curry), and Bob Lee (alias Bob Curry). After the robbery George Currie and George and Tom Roberts started north from the railroad mounted on horses purchased at Opal, Wyo., a few weeks previously; while the Logan's and Bob Lee went west along the Union Pacific Railroad and eventually turned up at Harlem, Choteau County, Montana. Three days after the robbery the three bandits who went northward ambushed some of their pursuers and succeeded in killing Sheriff Hazen. This occurred on Tea Pot Creek, northwest of Gasper. When pursued and pursuers reached that point they were close together, and soon after firing upon and killing Sheriff Hazen the three fugitives were so closely pressed that they were compelled to abandon their horses and saddles, which were cap­tured by the officers. These were taken to Cheyenne, where. the photograph of the animals shown on next page was taken. A few days after the kill­ing of the sheriff and the capture of the bandits' horses a posse of pursuers, while following the trail of the outlaws in the vicinity of E-K Mountain, north of the Hole-in-the-Wall country, stopped at the camp of a Mexican shep­herd, who informed them that George Currie and George and Tom Roberts had procured food at his place the evening before. While in camp he overheard Tom Roberts say: "Well, I guess I fixed Joe Hazen that time," which would indicate that, Tom Roberts had killed the sheriff. The trail of the three fugitives was eventually lost in the Big Horn Mountains, rendering necessary the abandonment of the chase for the time being. The officers afterwards learned that the three bandits went straight to Choteau County, Montana, where they were. joined by the Logan's and" Bob ", Lee, and here the division of the money secured in the Union Pacific robbery took place. The outlaws then once more separated, the Logan's and Lee going to Harlem, in Montana, where they opened a saloon, and Currie and the Roberts brothers disappearing from that region alto­gether. While at Harlem the Logan's sent a quantity of unsigned currency, stolen from the express car, and which was badly mutilated, to a bank at Benton, Montana, and requested good money in exchange. The robbers did not notice that the bills were unsigned, and evidently thought they were perfectly safe in making the deal. The Benton bank sent the notes on to Washing­ton, where the discovery was made that the money was some of that stolen at Wilcox. Officers were at once notified and put on the rail, but the bandits somehow received warning, and fled from the country. "Lonny" Logan was traced to Kansas City, where he was killed by officers while resisting arrest. In his clothing a number of the stolen banknotes were found. Several other members of the gang were finally apprehended and given suitable terms in the penitentiary. George Currie, the leader of the bandits, was killed by Utah officers near Thompson, Utah, while stealing cattle from a ranchman's herd. The identity of the dead man was not established for several weeks, when men who had known Currie since boyhood identified the body as that of the noted outlaw, who had died, as perhaps he wished to die, "with his boots on." Originally published in The Wide World Magazine, September 1900.